Staying busy at her job is what motivates Katya. 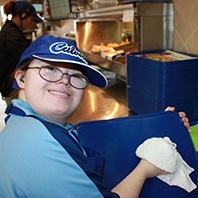 As a dining room attendant at Culver’s, Katya’s work-first attitude does not go unnoticed by the staff and customers. “Everybody here has been happy with Katya,” says Supervisor Kim in describing her work ethic. Katya also receives warm compliments from appreciative customers. Her love of cleaning led to her being directly hired by Culver’s in December 2014. She brings this passion when cleaning food trays, wiping the front entrance doors, and filling the condiments area. Katya values her independence. A close second is enjoying chocolate ice cream with Oreos after a busy work day! Katya also receives wonderful support from her family. She is picked up from work by her grandparents and greets them in Russian, their native language. Katya is close with her parents and two brothers as well. When she is not working, Katya enjoys playing on her Special Olympics basketball team. 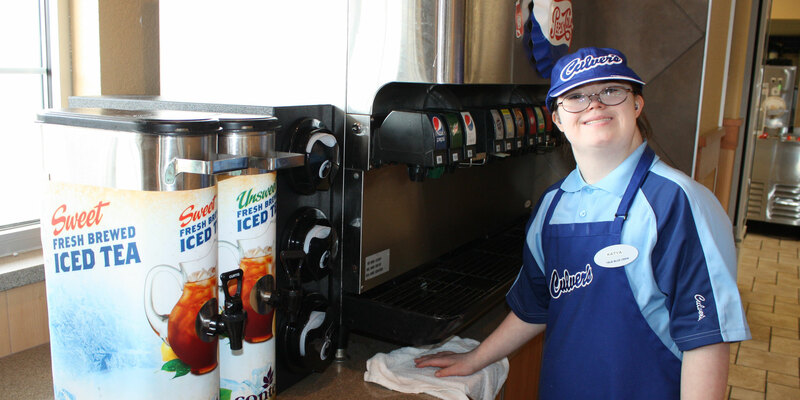 She brings the same winning spirit in athletics to her job at Culver’s!